Doors have functional and decorative purposes. Not only do they provide entrance to the house, they can also be decorative accents that improve the curb appeal of your home. As the saying goes, a house is only as good as its door. So what does your door say about you as an owner? Does it have peeling paint? Are the doorjambs loose? Are the hinges in need of oiling? Does it have scratches all over? If you answered yes to any of these questions, then now is the perfect time to check on your door. If you are a fastidious homeowner who wants to have a house that is in order down to the smallest details, you will know for sure the importance of door maintenance. After all, a front door is one of the first things your guests will notice when they drop by for a visit, and it is definitely one of the first things noticed by a prospective buyer. Also, having a well-maintained door guarantees that you will be able to use it for many years to come, saving you money in the long run because it helps keep the internal temperature of your home where you want it. 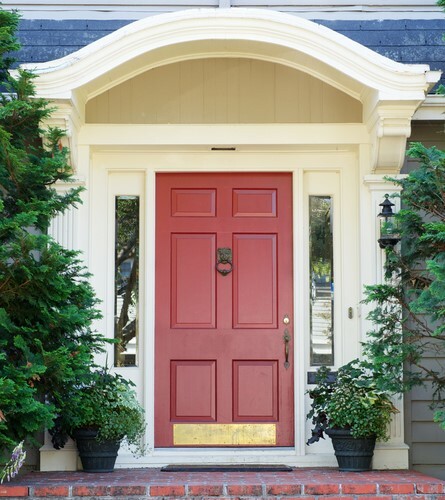 If you are doing an annual checkup of your home exterior to see if anything needs to be fixed, don’t forget to pay attention to your front door. With the frequent use and abuse coming from pets and children, the constant exposure from the harsh elements outside, even high-quality, well-made doors will suffer from wear and tear. Because of their utilitarian function within the home, doors are often taken for granted, which can be a grave mistake on the part of the homeowner. This should not be the case. By having a door maintenance program in place, you can avoid disruptions in the routine of your household caused by a malfunctioning door. You also get to save on utility bills since all of the leaks around the door will be sealed, keeping the hot summer air out while keeping you cool inside. You should also be aware that there could be safety implications caused by faulty doors. Keeping your door well-maintained means you also get to avoid potential liability that might arise due to an accident caused by a damaged door. Check your jambs-A great door jamb should be able to help you close and open doors seamlessly and without a problem. Most door jambs on the market come in a one-sided finish while the back of the jamb is usually left lacking. You can apply borate in the jamb that will serve as an extra layer of protection from moisture and insects. Check the seals-The hot and humid weather that summer brings can become intolerable, so it is best to check the top, bottom, and sides of your door for any leaks to prevent the heat from seeping in. Sealing the leaks around your door will lessen the solar heat gain, and will also lessen the load on your air conditioning unit reducing your utility bills. Caulking and weatherproofing are two time-tested and effective ways to seal the leaks on your door. Other possible causes for the leak in your door can be due to an improper door alignment and faulty installation of door hardware. This can be looked and taken care of by a door specialist from Doors of Elegance. Check for exposure issues-Check the door’s finish once every year. High-intensity sun, moisture, dirt and debris can impact a door’s finish. It can result in cracking, peeling, or streaking in the door’s finish. A simple coat of fresh paint and some sanding on your part can fix this problem. If you don’t have the time to spare, or you are simply at a loss when it comes to painting and caulking your door, contact us for a service appointment! One of our team members will gladly help out with the repair or replacement of your door.